There has been a lot talk about the LG eXpo, a phone that has a pico-projector. However, CES last year had on display Logic Wireless’ Bolt projector phone. That phone is capable of throwing a VGA image on the wall that is 64 inches wide. 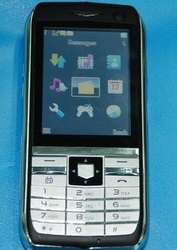 Of course, the projector is only one of the features of this phone that can run Symbian. It also has a touchscreen, as well as slots for two SIM cards. It also has two cameras, one for the front and one for the back. I suppose that this is some design for the days when cellular phones will be all video-capable. Yeah, I’m still awaiting that day myself. The Logic Bolt is available at, of all places, Sky Mall. It costs about $500, and that’s the unlocked price. I don’t know who wants this particular phone, as it doesn’t seem to have a carrier. I’m going to venture a guess and say that this will be on display on CES on a little more than a week. If so, I would like to see how the projector fares against pico-projectors. If it can make the images more clear, then there might be market for this. As it is, it seems a little excessive. Your ‘source’ link goes to an article on crunchgear about a golf ball launcher, not the projector phone. Thanks Dom, we’ve fixed it. Sorry for the oversight!